There are global brands that can impact a market not only with the products they introduce but even with the products they do not. In the powersports world that company is Honda. Respected by both their customers and marketplace adversaries, revered for their creativity and engineering, and legendary for many of the game changing models they’ve introduced, the question is always, “What will Honda do?”. In the off-road world that question revolved around when and even if Honda would release a high-performance Side x Side. Honda has answered. Meet the Talon. Deep inside the Honda campus near Torrance, California, across from the employee ball fields, gym, and even beach volleyball court sits a neat but otherwise ordinary office building. There’s no sign, but inside is where dreams are made. This is the Honda R & D center where engineers and concept artists are turned loose. Just inside the door is exhibit “A” and it happens to be a ¼ scale high-performance ATV model. It’s truly a work of art with a twin cylinder engine and bodywork that very much mimics a street bike, huge front shocks, beautifully machined A-Arms with sweeping curves to imply motion and allow for optimum geometry, and minimalistic hubs that allow you to see through the wheels all the way to the brake and spindle. At the back is something truly creative. Independent rear suspension via a pair of forged swingarms control the ride but there is no axle, driveshaft, or chain. This unit is hydraulic drive. Hydraulic lines are carefully routed into the motor at each wheel. Sadly, pictures are not allowed. The whole thing gets us excited about the new Side x Side we are about to see. Sweeping, dirt bike style bodywork with large open spaces above the wheels, and continuous flow of bodywork from front to back. Interior styling that creates two individual cockpits, each with comfortable, secure spaces for the driver and passenger. Tall, suicide style doors with smooth interior surfaces and a recessed pocket with an arm rest / handle. Large, comfortable seats with no flex! It’s difficult to build a model that fits every type of terrain. What works in the desert is hardly the best setup on the wooded, rocky trails of Hatfield-McCoy. The answer was to create two models, the Talon 1000R and Talon 1000X, and they share many similarities including a common main chassis, engine, and transmission package. The primary difference between the two is found in the suspension. 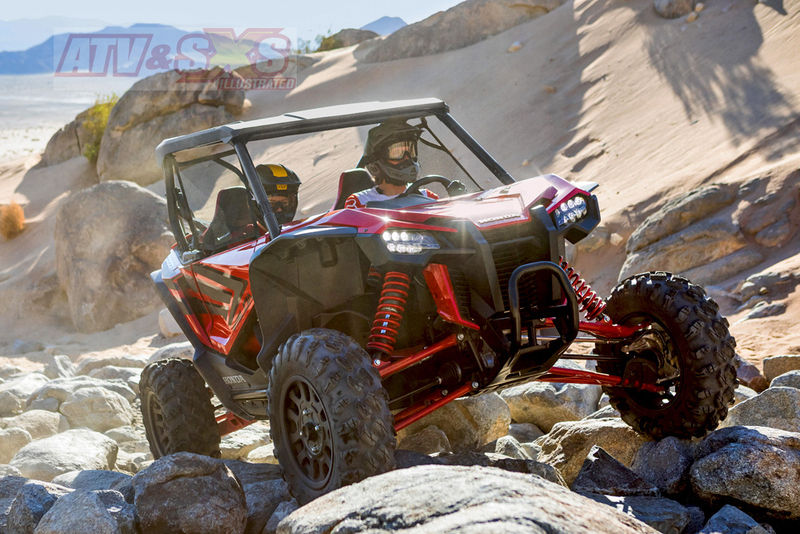 The 64” wide 1000X is Honda's answer for trail riders and the 3-Link rear suspension delivers 15.1 inches of travel controlled by Fox 2.0 QS3 shocks. 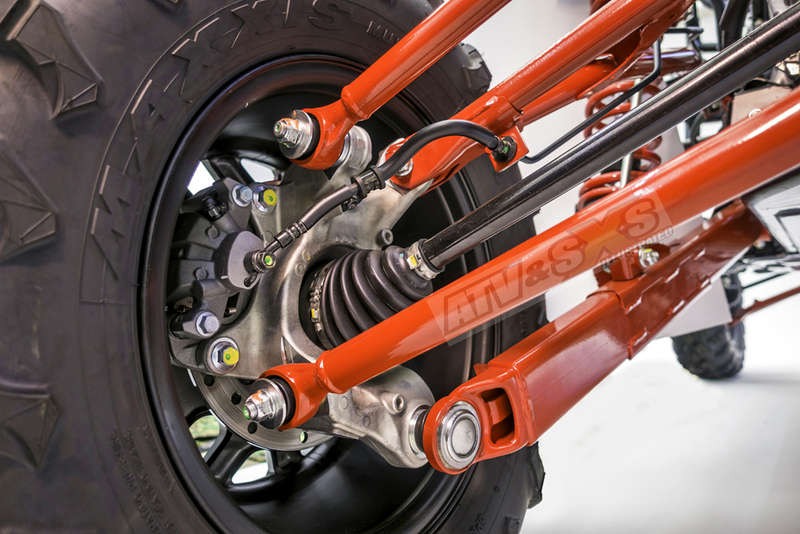 We really like the QS3 shocks for their ease of adjustment and serviceability. 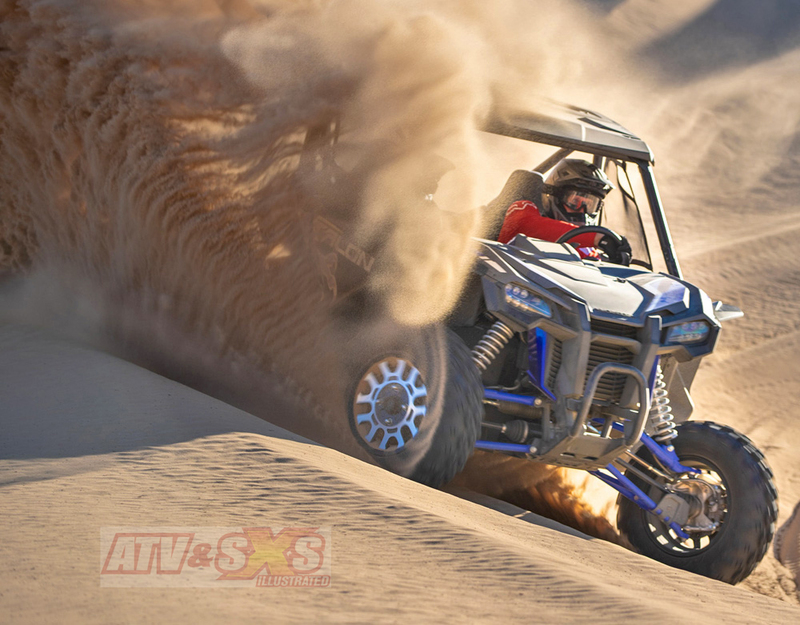 The Talon 1000R is 68.4” wide and the added width is meant for blasting across wide open terrain. 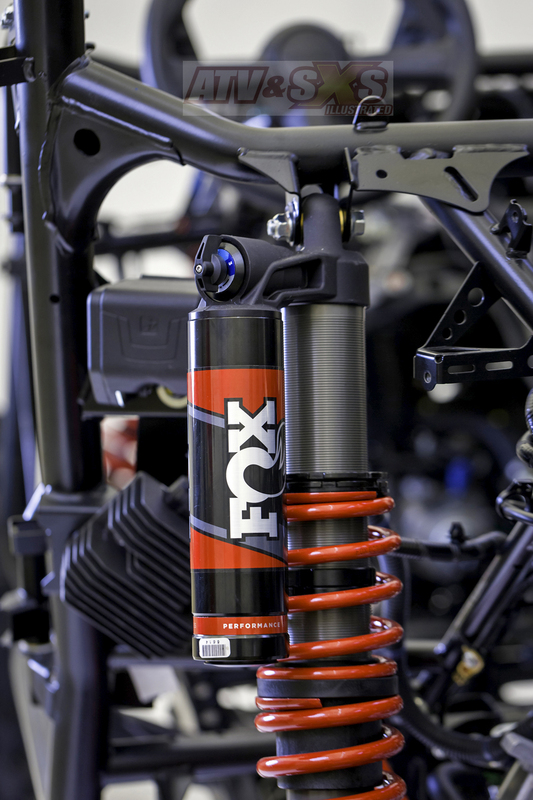 A 4+ Link suspension controlled by Fox 2.5 QS3 shocks deliver 20.1” of stroke. We also really appreciate the threaded 1st stage collar on the 1000R rear shocks which allows you to isolate that portion of the shock stroke. Typically that is something you pay for with aftermarket shocks. 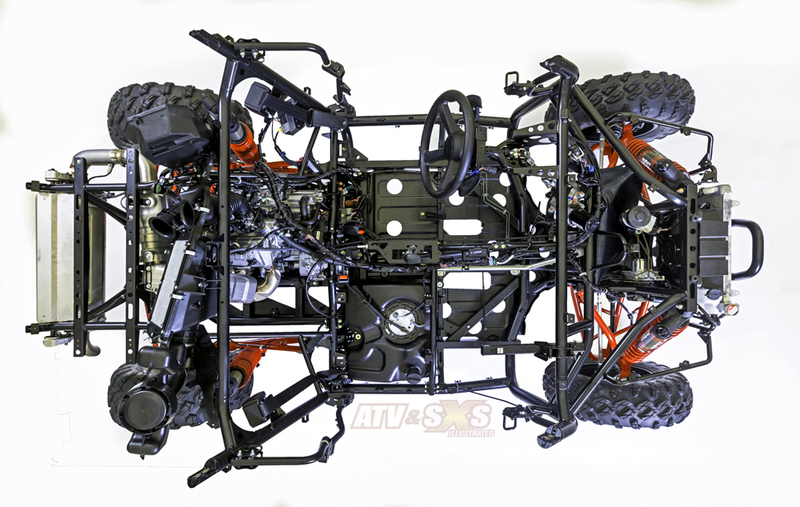 The overall suspension design is clean, beefy, and built to last. Thanks to careful design it also has practically zero change through the full suspension stroke. 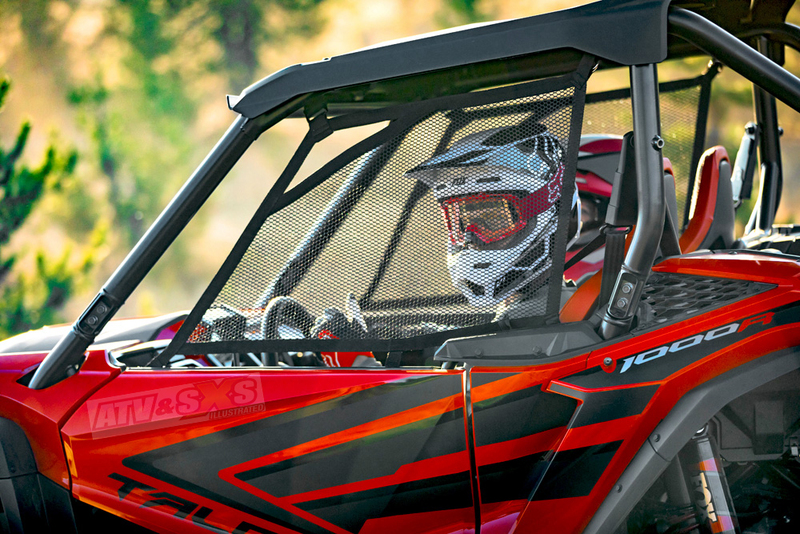 The front of both the Talon 1000X and 1000R feature dual A-arms with 14.6” and 17.7” of travel respectively. Underneath the chassis is a full skid plate and it’s even marked for drain holes and tow hook attachment points. 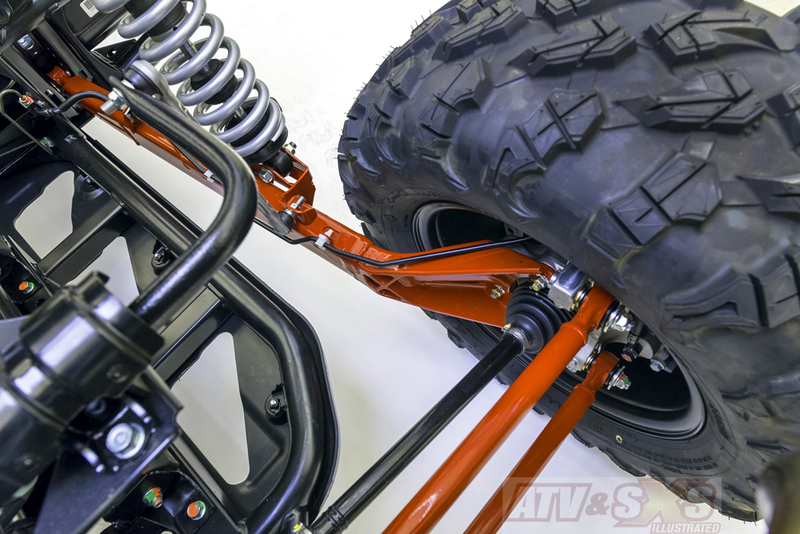 Honda also gives the Talon chassis maximum protection with both an E-Coat dip to seal the inside and outside of the chassis tubes, and a final Powdercoat for double the corrosion protection. 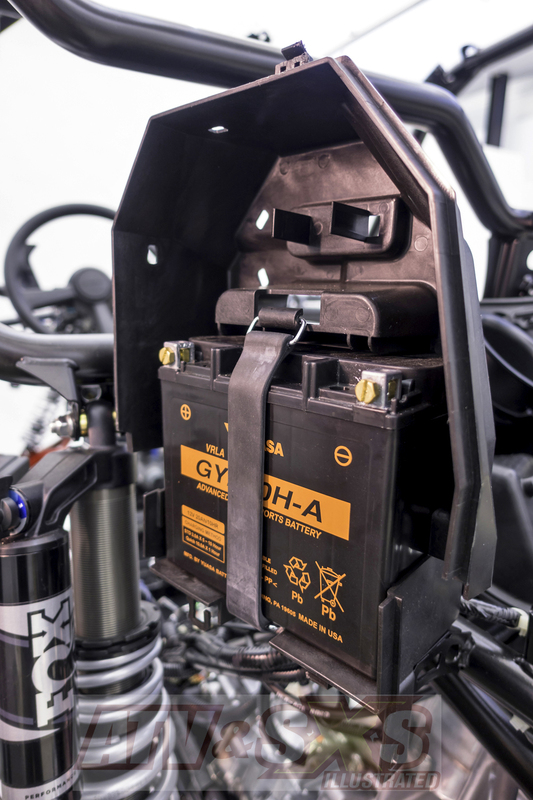 Honda developed a clever feature with the Pioneer 1000 that works much like traction control for maximum acceleration and stopping power and it works through the brakes. The system measures the slip between the left and right front wheels, then gently applies enough braking to balance the load. The effect is maximum traction and stability at any speed. The system is even linked into the transmission and when descending hills or decelerating it holds transmission downshifts for automatic engine braking assist. 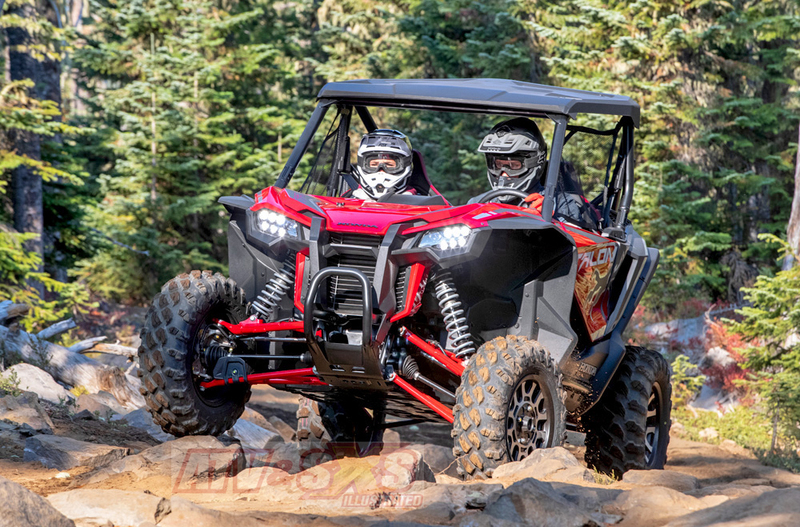 The engine and transmission packages on both the Talon 1000X and 1000R are nearly identical, and once again the Pioneer 1000 was a development platform for the sporty models to come! Rather than for hauling and towing heavy loads, the Talon engine and transmission is tuned for performance. 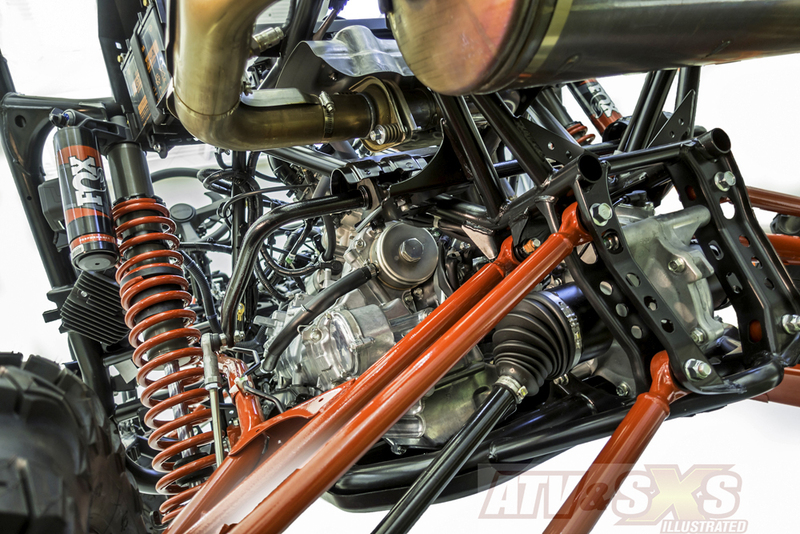 The 999c liquid-cooled, OHC, 4-valve Unicam parallel-twin engine is mounted longitudinally in the frame for much greater efficiency, and it’s very similar to Honda’s new Africa Twin adventure bike. 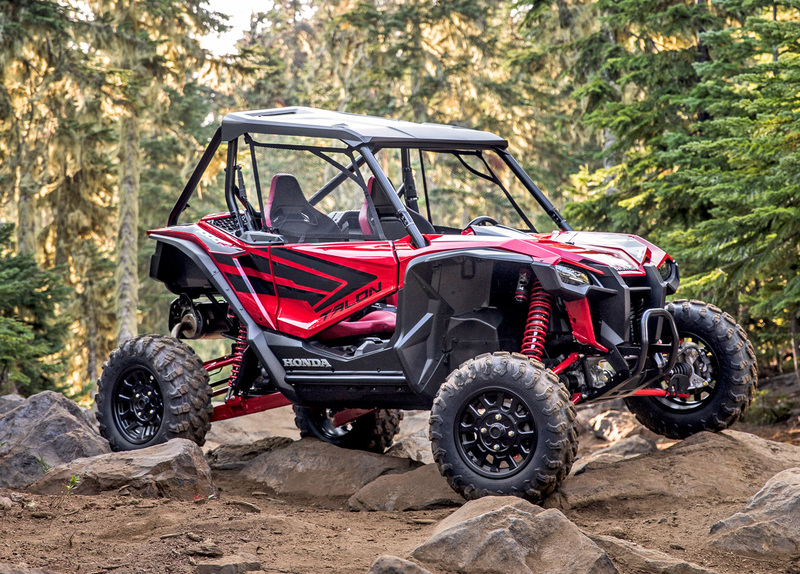 The Talon also gets the largest radiator Honda has ever built for a Side x Side or ATV. As always, it’s a good idea to wash it out between rides. There is no turbocharger bolted to the Talon, but we’re OK with that since we’re always a little wary of the excessive heat buildup. In our experience, the Pioneer 1000 was very smooth and practically vibration free but also quiet. Honda wanted a little more statement with the Talon and the engine note sounds strong and commanding. It makes its presence known without sounding obnoxious. We like it! Our favorite feature on the Talon is the transmission and every generation of this mechanical wonder gets better. The Talons Dual Clutch transmission features two clutches with each controlling half the gear set. As one gear set is driving you forward, the transmission has already engaged the next, but the clutch is standing ready to make the transition, which it does seamlessly. 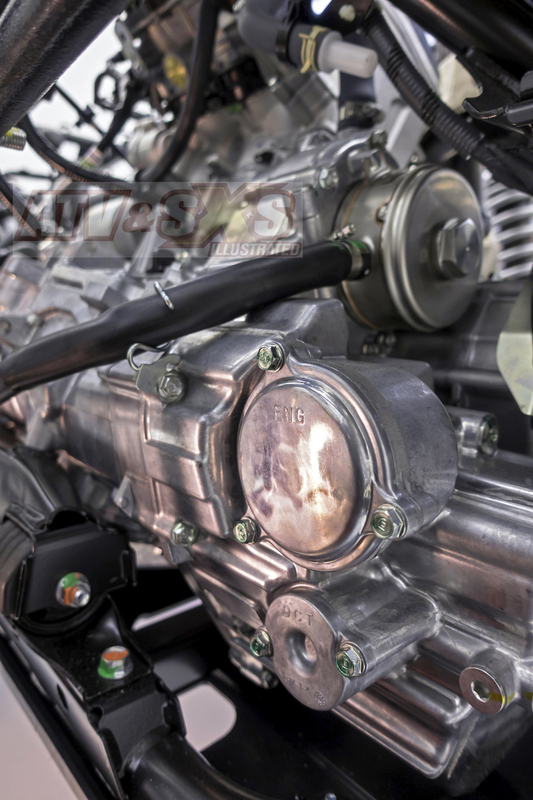 The result is a fast shifting, smooth transmission, and the entire system is managed by the ECU. On the dash is a button allowing you to select between two drive modes, Drive (for casual rides) and Sport Mode for when you really want to attack the trails. A Manual mode operated by paddle shifters gives you complete control but there is no rider on the planet who can consistently shift more efficiently than the DCT. The system even features adaptive learning (again like some cars and trucks do) and it begins to sense your riding style and adjust itself accordingly. Switching between modes can be done on the fly and at any time you can override it with the paddle shifters. This makes it an absolute blast to drive by leaving it in Fully Automatic Sport mode, and then flick it down a gear in the corners with the paddle shifter. How a model feels even before you start the engine is a huge factor in vehicle satisfaction. Perhaps more than any other area this is where Honda absolutely excels. They ALWAYS nail the ergonomics. The experience with the Talon begins as you open the door. Suicide doors on the Talon open fully for good access. 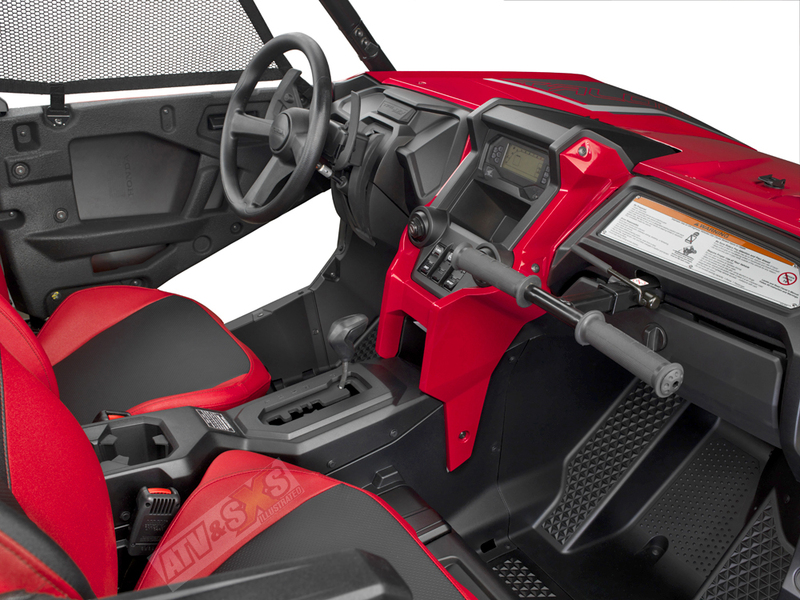 The doors feature an open ventilation area similar to Arctic Cat’s Wildcat Trail suicide doors, and a single inside latch. Above the doors are safety nets that clip into the front pillar, although it’s a given most owners will remove the nets at some point. The Talon seats are a little larger than on most Side x Sides, but they also feel solid! There is no flex and we like the ample padding in the side bolster and along the hips. Drawing on their automotive experience Honda equips the Talon with a high-quality seat adjustment system that slides precisely and locks into place. The steering wheel reaches back for the driver much like it does in a desert truck, and it can be adjusted through a wide range of motion. To the left of the wheel are the light switches, and we generally like the placement although they are slightly blocked by the wheel. At your fingertips right behind the wheel is the paddle shifter and it appears to be the same assembly used in the Pioneer 1000. In the center console between the seats are the transmission control switches. The passenger experience is not an afterthought on the Talon. Time and time again it was stressed that the thrill of dirt bikes and sport ATVs are not just something only to be experienced by one. The Talon was meant to share every aspect of the experience with the passenger because that’s what Side x Sides are all about. Honda intended to make them part of the vehicle rather than semi-detached cargo. The passenger gets a well-designed, comfortable cockpit that gives a feeling of both safety thanks to the high doors, but also quality from the seats. Passengers get a large area to stretch one's legs but also a pair of angled footrests that act very much like a foot peg. We also like the passenger handhold which is adjustable but won’t rattle around on the trail. Reliability is directly tied to routine maintenance and on every new model, we look for easy access to key components. 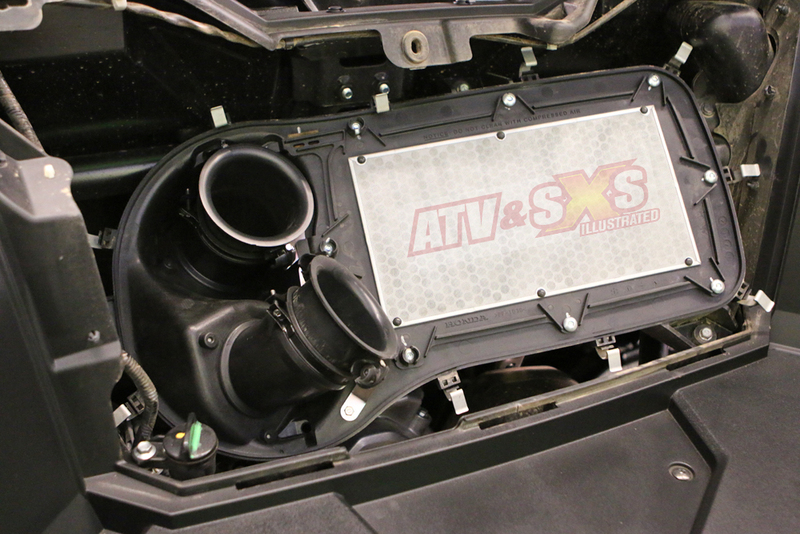 Both the engine and transmission use cartridge style filters that sit at the rear of the engine behind small covers. Access couldn’t be any better. The skid plate is even marked for oil drain holes, and the battery sits in its own compartment just above the left rear wheel. Honda was very concerned with how the engine breathes and realizing that Side x Sides often live in a very dusty environment they intended to filter out much of the grit long before it met the filter. As a result, the air filtration system looks like it came from a helicopter. Behind a panel at the front of the bed is what looks very much like a CVT cover and it is held in place by 11 snaps. Once you pop the cover you’ll find the intake tubes and a metal screen that could stop a baseball. Behind the screen is the actual filter but you’ll need to pull a few screws to get it out. It’s a little more complicated than some systems but if it helps keep grit out of the engine we’ll take it. 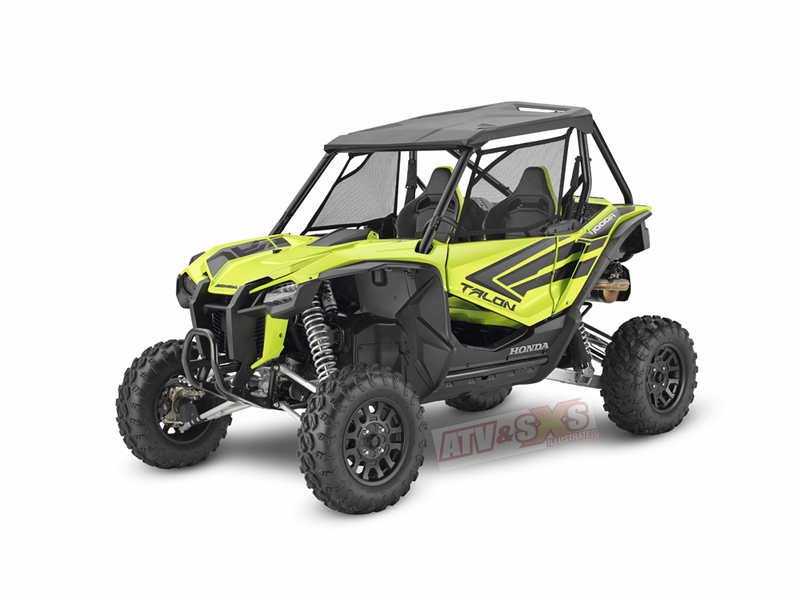 Search Tags : 2019 Honda Talon SXS Information - 2019 Honda Talon Sport SXS For Sale - 2019 Honda Talon Top Speed - Honda Talon Specs - Honda Talon Price. Commonly asked questions around the new Honda Talon SXS. 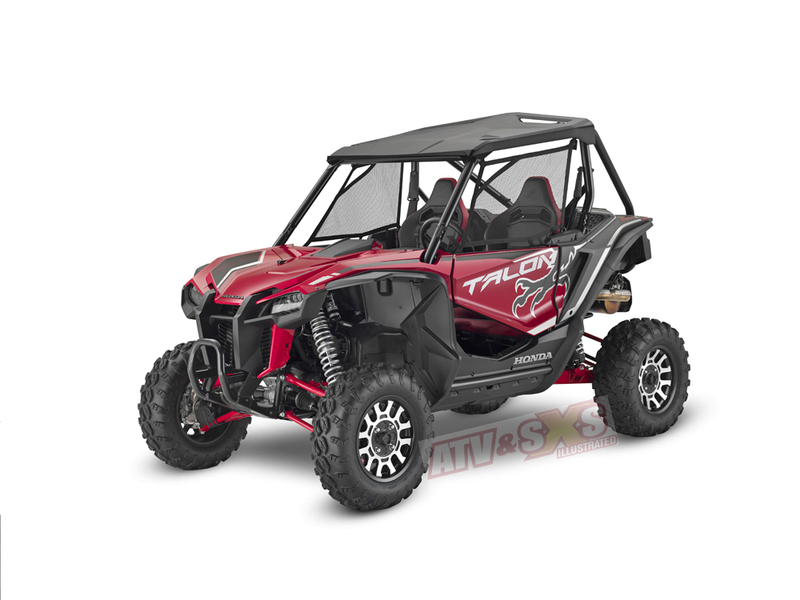 What honda dealer has the honda talon in stock. 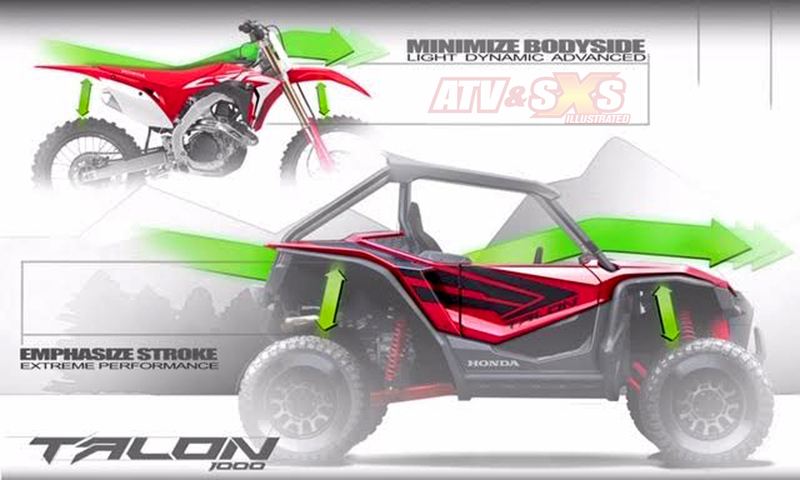 When will accessories for the Honda Talon be available? Can I buy Honda Talon Accessories online for sale with a discount?